Shorelands is a prestigious quality new development by Boland Reilly Homes comprising superb new semi detached villas and cottages set in an unrivalled location opposite the sea shore. Ideally situated on the edge of the village just off Main Road, this beautiful site exudes a fresh coastal atmosphere with an added degree of sophistication clearly reflecting a modern lifestyle but in a much more relaxing environment. 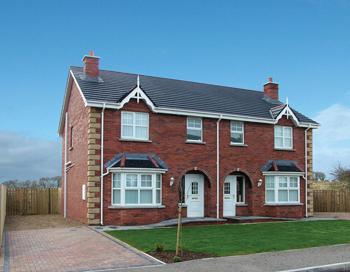 Many local amenities are close by with the added bonus of being situated on the Ards Peninsula - an area of outstanding natural beauty - and within a short drive of Portaferry, Kircubbin, Ballyhalbert and Greyabbey – areas well known for their outstanding restaurants, sailing and first class golf courses. The village of Cloughey itself boasts several beaches, tennis courts and the excellent Kirkistown Castle Golf Course. This outstanding development boasts an excellent mix of house types providing a superb variety of thoughtfully planned internal layouts, all carefully built to the very latest building standards, yet ensuring that comfort has not been compromised at the expense of design. The well proportioned accommodation is perfectly geared for the rigours of a modern lifestyle with the attractive elevations contributing to the atmosphere of the overall coastal living environment. These new homes at Shorelands enjoy every aspect of seaside village life.